Things to do wherever you are! Cape Town is set on a spectacular mountainous peninsula jutting into the southern oceans. This full day tour is an ideal way to see the highlights and appreciate the surrounding natural beauty. WHAT YOU'LL BE DOING You’ll travel along the Atlantic seaboard with its gorgeous white beaches and rugged mountains to Hout Bay. If time permits, you have the option of taking a half hour boat trip to Duiker Island to see a Cape Fur Seal colony (at an extra cost). If open, you’ll continue on Chapman’s Peak Drive, renowned as one of the most stunning roadways in the world. You’ll visit the Cape Point Nature Reserve - the tip of the Cape Peninsula that has captivated travellers for centuries with its dramatic scenery and fascinating history. The return journey to Cape Town takes you along False Bay coast with the option of visiting the colony of rare African Penguins at Boulders Beach (at an extra cost). You’ll pass through the naval village of Simon’s Town, Fish Hoek, Kalk Bay and Muizenberg. You’ll visit the world-famous Kirstenbosch Botanical Gardens before arriving back at your hotel. NOTES: - This tour will not operate on 10 March 2019 and 20 April 2019, due to the Cape Town Cycle Tour and the Two Oceans Marathon. CAPE TOWN: Set out from Cape Town. The tour departs at around 09:00 from the Cape Town City Bowl, which is hugged by the wide arms of Table Mountain. Cape Town’s vibrant and multicultural population is a legacy of its history as a safe haven for passing ships and traders. A genial Mediterranean climate and the stunning natural beauty causes locals and visitors alike to fall in love with the city. As we travel through the town you might notice the distinctive gable design on some of the buildings - this is a characteristic of Cape Dutch Architecture, inspired by the Dutch farmers who first settled in the area in the 1600 and 1700s. The road out of town takes us through the historic suburb of Sea Point. Segregated as a whites-only area during the years of Apartheid, a stroll down the cosmopolitan Sea Point Promenade is a potent symbol of the unity the country now enjoys. Cruise past prime real estate with glorious coastal views. The road meanders out of Sea Point and into Clifton which is home to some of the most expensive real estate in the country. Looking to the right, you should be able to catch a glimpse of Clifton’s four pure-white sand beaches, sheltered from the south-easterly wind and revered by sun-worshipers everywhere. You might notice that Clifton has some unusually small properties, a legacy of World War 1 when returning soldiers were awarded small plots between the Fourth and Second beaches. The original bungalows were built from packing cases used to transport motor cars in the 1920s and 30s. Next to Clifton is the similarly affluent suburb of Camps Bay, famous for its long beach and pumping nightlife. Extremely popular with locals and international tourists throughout the summer, this is the place to strut your stuff, and be seen. HOUT BAY: Victoria Coastal Road in the shadow of the Twelve Apostles. Named in honour of Queen Victoria’s jubilee in 1888, this road hugs the coast as it winds around to Hout Bay. Overlooked by the famous Twelve Apostles on one side, and with the seemingly endless Atlantic Ocean on the other, this is a favourite drive for many. The road was carved out by famous road engineer Thomas Bain, responsible for many of South Africa’s most beautiful mountain passes. A true renaissance man, he had a keen interest in natural history, geology, archaeology and palaeontology. Hout Bay is a cosy little hamlet surrounded by mountains to the North, East and West and the Ocean to the South. Home to bustling craft markets, antique shops, big wave surfers and a thriving fishing community. It is much beloved by locals, who have attempted to get it declared an independent state in the past. Hout Bay (Wood Bay from the Afrikaans) was established in the late 1600’s when the Dutch needed a great quantity of timber for building and other projects. Since then, its rural, idyllic charms have been enticing people for centuries. DUIKER ISLAND: While visiting Hout Bay you can take a boat trip to Duiker Island, time permitting and at your own expense. A favourite outing of many visitors to Hout bay, this small island is home to thousands of Cape Fur Seals and local birdlife. The boat ride out from Hout Bay lets you see the Cape Peninsula from a new perspective. Duiker Island is only 77 x 96 metres in size but is teeming with wildlife and is a renowned marine haven. Twists and turns around the World Famous Chapman’s Peak Drive. With a towering mountain above it and a sheer drop below, Chapman’s Peak Drive hugs the face of its namesake as the road curves around to Noordhoek from Hout Bay. Chapman’s Peak Drive is renowned for its spectacular 180° views of the Cape Peninsula as well as its 114 twists and turns. Viewpoints and picnic spots are scattered throughout its 9km length and its dramatic views have made it a favoured spot for photographers. Construction began on the road in 1915 and it was fully opened in 1922. It is built upon a 630 million-year-old Cape Granite Contour. It was considered a marvel of road engineering at the time of its construction. CAPE POINT NATURE RESERVE: Our journey now reaches the tip of the Cape Peninsula, a dramatic viewpoint located in a 17 750 hectare nature reserve. Looking out over the shining sea from the Cape Point Lighthouse truly makes you feel like you are standing at the edge of the world. You may also feel the brisk touch of a wind dubbed the “Cape Doctor” for its healing powers. The rich diversity of the nature reserve, part of the Table Mountain National Park, makes it home to a stunning array of animal and plant species. Visitors can encounter buck, baboons, Cape Mountain Zebra and over 250 species of birds. The reserve is also one of the largest breeding grounds for tortoises in the world. 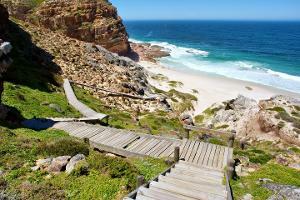 After leaving Cape Point Nature Reserve, we travel up the other side of the Cape Peninsula on our way to Simon’s Town. On a clear day, you may be able to see the mountains and coastline all the way on the other side of False Bay. The road may not be as steep as Chapman’s Peak Drive, but its dramatic views are just as enticing. Visit the Penguins at Boulders Beach. Since 1985, a colony of African Jackass penguins have made their home between the boulders and white sand of Boulders Beach and these small citizens have been charming residents and tourists ever since. Located just round the corner from Simon’s Town, the colony is best accessed via the Boulders Visitors Centre (at own expense), whose boardwalks allow you to get up close and observe the penguins in their natural habitat. Simon’s Town has been an important naval base and harbour for over two centuries and you can still see some historic naval vessels anchored just off-shore. On a visit to the town, you might see the famous statue of Just Nuisance, the only dog to ever be officially enlisted in the Royal Navy. The town also has a fantastic collection of restaurants and boutique stores. Picturesque drive past Fish Hoek and Muizenberg (it is unclear whether there are stops in Fish Hoek and Muizenberg). As we head back towards Cape Town along the False Bay coastal road; we will travel through Fish Hoek (Vishoek in Afrikaans), a little town with a long history. There have been records of people living here on the earliest maps of the area. Leisure activities like surfing, sailing and sunbathing on Fish Hook’s 1,5km stretch of beach now join the more traditional pursuits such as angling and ‘trek’. From Fish Hoek, we will drive past Muizenberg, another seaside town. The warm waters and the long stretch of beach make this a popular spot for holidaymakers and there are a wide variety of activities, like kite boarding and surfing, for the adventurous. KIRSTENBOSCH BOTANICAL GARDENS: The lush and diverse Kirstenbosch National Botanical Gardens. Gentle walking paths, inviting grass lawns and an astounding variety of indigenous plant species await you at our last stop on the tour. The Kirstenbosch National Botanical Gardens is justifiably acclaimed as one of the great botanic gardens of the world. Set against the gentle lower slopes of Table Mountain it is the perfect place to unwind at the end of the day. Established in 1913 to conserve and exhibit the incredibly rich flora of Southern Africa, Kirstenbosch displays an enormous variety of indigenous species. You will see many great examples of unique Cape Flora as we enjoy a walking tour of the gardens. RETURN TO CAPE TOWN: Our return to Cape Town will take us past the University of Cape Town, the Rhodes Memorial and Groote Schuur Hospital (site of the world’s first heart transplant). We will deposit you safely, and happily, back in town. Dual language - English/German - commentary on selected days: Sunday, Monday, Tuesday, Wednesday, Thursday and Friday.